“The most interesting period (in Tanzania) is starting now,” So said Mr Haroub Othman, Director of the Institute of Development Studies of Dar es Salaam University in almost the final words of a conference given at the School of Oriental & African Studies (SOAS) on June 26th and 27th 1986. I confess that my own view had been the opposite of this. I wondered how the international interest which has been for so long concentrated on the Tanzanian ship could survive the departure of its pilot. There is of course a lot of debate as to who is now piloting the ship but if one is to judge by the number of headlines and photographs appearing in the Tanzanian press, the pilot is still aboard. What will happen when he eventually disembarks, under the heading, in each case, “Tanzania after Nyerere”, has been the subject of a 25 page cover story in the May/June issue of “Africa Events” and also the conference referred to above which attracted the largest assembly of Tanzanophiles (almost 200 people) since Mwalimu’s last visit to the UK. And then the “Tanganyika Reunion,” at its Jubilee event at the Royal Commonwealth Society on July 25th 1986, attracted almost 300 people including several Tanzanians. Participating in the cutting of the cake was Mr. Geoffrey Hucks, well known in Tanganyika many years ago as the person responsible for the conduct of the early elections. Once again this has been an event packed four monthly period. After years of debate Tanzania finally decided to do a deal with the IMF, and this was followed in Paris in June 1986 by one of the best attended World Bank sponsored Consultative Group Meetings yet held. Then came a courageous and generally well received Budget. These matters are covered by Roger Carter in an article starting on page 3. The Budget was followed by a month-long debate in the National Assembly in which members had no hesitation in expressing their views. See “Free Speech” on page 7. Readers of the “Guardian” on June 11th 1986 must have been surprised to see the heading “Nyerere Doubts on the One Party System” which quoted Zambian newspapers as saying that Mwalimu had stated that “The single party system breeds complacency among the electorate and their elected representatives because there is an absence of political challenge to keep the leaders of the ruling party on their toes. Party leaders in some areas (of Tanzania) have become so complacent that they do not hold any meetings; others do not bother to hold elections to fill vacant party posts” . Roger Carter has written an article on the one-party system which begins on page 19. On the lighter side, I understand that two intrepid Englishmen returned in July 1986 from a journey that they described as to “the centre of the Earth” – by bicycle! The centre was an unnamed spot in the Xinjiang province, N. W.China. They said that they found a few camel tracks, some bushes and a bit of dried camel dung. An earlier adventure was in Tanzania and they wrote a book about it which is reviewed by Martin Burton on page 25. A more serious review about the use of bicycles as transport in Tanzania is reviewed by Mel Crofton on page 26. Tanzania’s most critical economic problem is the fact that foreign exchange income from the export of goods is less than one third of her minimum import requirements. As a result, imports have been ruthless1y cut back and part of the remainder has had to be financed by external grants and loans, which are increasingly difficult to negotiate. External debt amounts to 3.5 billion dollars, or nearly 70% of the gross domestic product. By March 1986 external payments arrears stood at 700 million dollars and total debt service obligations* were already the equivalent of about 60% of export earnings. This very grave situation was brought about by a combination of influences – the toll on foreign exchange reserves exacted by the war in Uganda, the effects of the oil price shock of 1979-80, the world recession, adverse terms of trade in Tanzania’s exports, a series of drought years and above all the decline in agricultural and industrial performance caused by the need to cut back on imports of essential spares and inputs, with cumulative effect on the economy. In the middle seventies Tanzania’s economy was strong and malleable enough to recover from the first oil price shock and the effects of the severe drought of 1974- 75, but the combined effects of the fresh blows sustained at the turn of the decade proved too much for Tanzania’s frail economy. The result was a downward spiral of economic performance. Escape from this trend was bound to be both difficult and costly and to require the active co-operation of international organisations and friendly countries over a substantial period of time. The protracted negotiations of Tanzania with the International Monetary Fund (IMF) have often been referred to in the ‘Bulletin’. These discussions have extended over a period of more than seven years and until 1986 they have led to no lasting agreement mainly for four reasons. First, Tanzania feared a violent and perhaps uncontrollable rise in inflation as a result of the drastic devaluation demanded by the Fund, bringing with it the risk of civil disorder. Secondly, Tanzania saw the Fund’s proposals as a potential threat to the country’s political ideals. Thirdly, it was calculated that the short term nature and relatively high cost of Fund facilities were bound to impose impossible burdens just at the moment of tentative recovery. Fourthly, IMF finance alone was adequate neither in amount, nor in duration, to fund a recovery programme, The experience of the aborted IMF agreement in 1980 showed that a Fund programme did not automatically open the door to complementary external finance. The Fund’s record elsewhere in the ‘Third World’ was not reassuring. Moreover, Fund support was terminable automatically if Tanzania failed to deliver on the Fund’s performance criteria, leaving the economy in the lurch. In May 1986, provisional understanding with the IMF was finally reached. This outcome was understood to have been made possible by the presence of the World Bank during negotiations, which introduced a moderating voice into the discussion, emphasizing the need to safeguard Tanzania’s potential for development. Moreover, the participation of the Bank held out the hope of Bank and bilateral support for structural adjustment on soft terms. The approach of the Fund and the Rank in tandem to the problems of the least developed countries during recent years reflects a growing realisation in America and elsewhere that the Fund, with its primary concern for measures needed to restore balance to foreign exchange accounts and the severely restrictive nature of its prescriptions, was not a suitable instrument for dealing alone with the problems of poor countries. This new approach was later described by the US Secretary to the Treasury, James Baker, as “adjustment with growth”. The negotiations involved from the outset both the Fund and the Bank and on their successful conclusion a so-called Consultative Group Meeting was summoned in Paris on 1Oth and 11th June, at which representatives of the Tanzanian Government were able to explain their proposals for economic regeneration to representatives of the Bank, the IMF, 18 bilateral donor countries, the African Development Bank, the Commission of the European Communities and other bodies. The object of these meetings was to consider how the shortfall in resources to meet a minimum import bill of 1,205 million dollars was to be funded in the first year of the Economic Recovery Programme. The result was agreement in principle for the first year of a three year programme on an IMF standby credit of 45 million dollars and an IMF structural adjustment facility of 24 million dollars , drawn on the IMF Trust Fund. At the same time the Rank undertook to negotiate a structural adjustment loan of 50 million dollars in the first year of a five year programme and a drawing on the sub-Saharan facility in the same amount, both on ‘soft’ terms**. It was expected that these agreements would facilitate debt rescheduling, thus making possible a resumption of imports with the resources now becoming available as well as reducing the annual debt service burden. Initial negotiations on the debt position are to be held in Paris in mid-September. The total sum required to close the gap between the minimum import bill and export earnings in the first year was estimated to be 550 million dollars. With debt rescheduling providing some postponement of foreign debt obligations, it was calculated that, after taking into account the contributions from the multilateral organisations, some 260 million dollars would be necessary from bilateral sources. In the event, bilateral commitments of about 150 million dollars *** made at the Paris conference fell short of the desired total by about 100 million dollars As a result, an import bill of 1,100 million dollars is now being assumed for purposes of planning and resource allocation. Amongst he bilateral donors, the United Kingdom offered $10 million in the first year as so-called ‘programme aid’ to provide foreign exchange for essential imports from the United Kingdom, A further £10 million would be available in 1987-88 subject to continued implementation of the agreed programme. In addition, 255 million of untied aid would be available in 1987-88 in association with the World Bank’s Special Facility for Africa. 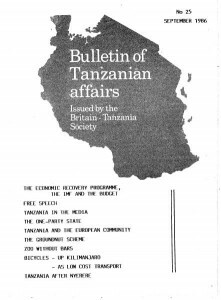 These agreements were based on the Tanzanian Government’s Economic Recovery Programme, details of which were disclosed during the budget speech of 19th June 1986. This programme drew on the advice of the Presidential Commission on Exports under the chairmanship of Hon. Amir Jamal MP, whose report was submitted in August 1985, by making a radical adjustment of the exchange rate and by further increasing producer prices. The price of the shilling had already been adjusted downward from Tshs 17.7 to the dollar in 1985 to Tshs 29.4 to the dollar in early June 1986. On 20th June the value was fixed at Tshs 40 to the US dollar, or roughly 60 shillings to the pound. Devaluation in successive steps rather than a single mighty jump suggests that with Bank support, Tanzania’s policy of stepwise adjustment had prevailed over the Fund’s preference for a single drastic reduction in shilling values. 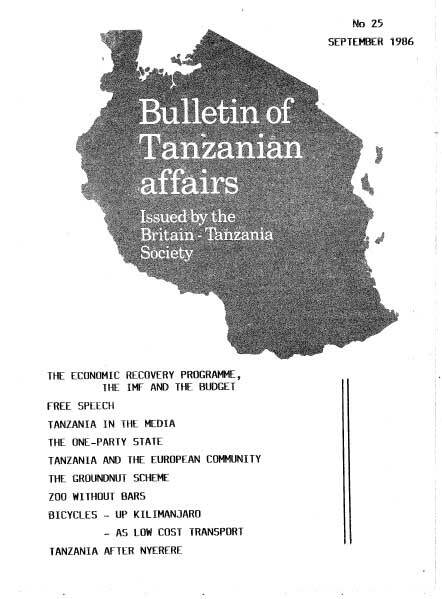 The Tanzanian approach was held to provide the best means of keeping inflation under control. Henceforth the rate is to be adjusted monthly in line with Tanzanian inflation and at the end of July a rate of Tshs 42 to the dollar had been reached. Devaluation may mike some Tanzanian exports more competitive on world markets, except in those cases where prices are fixed internationally, or quantities determined by quota, but it will also increase the shilling price of imports, thus immediately triggering substantial price rises, the amount varying in accordance with the import content of particular commodities. Only in the longer run, as production levels in industry rise from the present average capacity utilisation of between 20% and 30% and as economic infrastructure, notably roads, railways, vehicles, fuel and spares, is improved, will downward pressures on the price level gather strength. Mercifully, the fall in oil prices has recently brought some relief. The prices paid to producers of Tanzania’s exports were substantially raised in the 1984 budget, but now further increases took place in amounts varying from 80% for coffee to 30% for cotton and tobacco. In general, it is planned to maintain producer prices at 60% to 70% of export prices at the Tanzanian port, The Government also plans where possible to limit the increases in price of agricultural equipment and inputs by changes in taxation and by encouraging new investment. To cushion to some extent the inevitable sharp rise in the cost of living, allowances will be paid to teachers amounting to 25% of salary, while civil servants will be given allowances ranging from 30% of gross earnings on the minimum wage to 2.5% on salaries in excess of shs.6,000 per month, pending the recommendations of the Nsekela Commission on public sector salaries at the end of 1986 At the same time the rates of income tax will be revised downwards. Hitherto, tax has been collected at rates varying from 25% to 95%, but henceforth rates will range from 20% to 75% The combined results of these changes in salary and income tax will be an increase in monthly earnings ranging from 30% for minimum wage earners to 14.4% for those earning more than Tshs. 6,000 per month, Without departing from the general redistributive function of income tax, the intention is to give the maximum relief to the poorest and at the same time to provide additional incentives for those in the middle and upper salary ranges. The incomes of those outside the civil service are expected to rise in similar fashion. To stimulate domestic saving, interest rates will be raised in stages until they reach a level commensurate with the market value of capital. Furthermore, strict national housekeeping and increased external resource flows will progressively reduce the budget deficit t o be financed by bank borrowing from Tshs. 5,200 million in the 1985-86 budget to Tshs 2,500 million in 1986-87. Budgetary control as a means of reducing inflation occupies a prominent place in the Economic Recovery Programme. Government financing of parastatal deficits will be ended and additional domestic finance will be available to them only through internal savings, or through the financial institutions. This objective, it must be said, has featured in successive budgets, but has not hitherto been achieved. The Economic Recovery Programme has been planned over a period of three years. Total minimal foreign exchange resources required in 1986- 87 will be 1,205 million dollars, though, as already stated, finance for only 1,100 million dollars is expected to be forthcoming. In the second and third years the requirement will rise to 1,230 million dollars in 1987-88 and 1,300 million dollars in 1988-89. The hope is that this level of resources will enable Tanzania to increase her export earnings by 11.6% in 1987, 19% in 1988 and 19% in 1989, thus raising export income from an estimated 400 million dollars in 1986 to 632 million dollars in 1989, Even this will take Tanzania less than half way towards the goal of self-reliance in foreign trade. The target requirement of foreign exchange resources is, moreover, minimal and leaves little room for imports that are not essential to the Recovery Programme, or for the accumulation of contingency reserves. The Minister of Finance has recognised that the attainment of self- sustained growth will be a long haul – he has suggested five to seven years – and steps are now being taken to work out a Second Union Plan covering a five-year period from July 1887, based on economic trends and future prospects. The future will also depend on the human reaction to measures now being taken. There is a good deal of evidence both in Tanzania and elsewhere that peasant farmers react sensitively to incentives and disincentives both in the volume of their marketed output and in their choice of crops. The budget seeks to provide incentives by increasing producer rewards, improving access to farm machinery and inputs, and increasing the supply of common consumption goods by restoring industry to reasonable levels of output. Improved performance within parastatal and private industry is encouraged by alterations in the income tax structure, an improved flow of foreign inputs and machinery spares and a stricter credit regime. But not all human incentives are amenable to financial manipulation and much depends on the quality of leadership given by the Government and the Party. People work hard irrespective of material gain when they believe in what they are doing. Very grave dangers lie ahead. The initial inflation provoked by devaluation may prove to be much more serious than expected, causing damage to public morale and risks of urban disorder. Industrial regeneration relies on foreign purchases, which will only become possible when new external resources become available . Agriculture, on which the country mainly relies for increased exports, is unavoidably slow to respond to new planting, better husbandry, increased inputs and improved infrastructure. So there will inevitably be a substantial period of greatly increased costs and negligible gains before the benefits of the recovery programme take hold. This time lag will be damagingly increased if there is delay in the payment of donor contributions. Finally, the underfunding of imports by 100 million dollars is a matter of considerable concern. The future is, therefore, – full of uncertainties. It now remains to be seen whether by astute management the Tanzanian Government can survive the interregnum and use this limited opportunity to reverse the country’s economic decline. *Of Tanzania’s debt outstanding in 1984, 80.3% was from official sources and largely at concessionary rates, while 19,7% was from private sources. **’Soft’ terms are negotiated by the Bank’s affiliate, the International Development Association, and provide for a 50 year maturity and repayment beginning after 10 years. There are no interest payments, but a service charge of 0,75% on the disbursed balance and a commitment charge of 0.5% on the undisbursed balance are levied. ***Outright grants or loans or concessional terms. The Budget debate in the National Assembly on the estimates of different Ministries of Government has been characterised by a great deal of free speech. The MP for Liwale, Major Abbas Ngayaga demanded that the Government should explain properly the reasons delaying the construction of the Kibiti-Lindi road for over two decades. He said that the people in the southern regions had at one time decided to work on the project on a self-help basis, but the Government restrained them saying that it would handle the project. Since then nothing had been done. He t old the House that the Southern Region could not carry on commercial production because they could not transport the produce for lack of reliable roads. Kajor Ngayaga also called on Cabinet Ministers and other senior Government officials to stop blaming every problem the country was facing on “the difficult economic situation,” saying that such lame excuses demoralised the people. “If they are not blaming the problems on the difficult economic situation, then they are blaming it on the break-up of the East African Community, dictator Idi Amin’s war of aggression or lack of assistance from donors” he said. “It was hypocritical for the Government to talk of a “difficult economic situation” when people caught stealing Government property were not being taken to task” he continued. Ndugu Alfani Kihiyo (Korogwe) said that the Segera-Tanga road remained as bad as ever with the Mwananchi Engineering and Construction Corporation (MECCO) “dilly dallying” on the road in the name of carrying out repairs. Ndugu Edward Lowasa (National) said that he could not understand why Air Tanzania Corporation (ATC) failed to make profits in its domestic operations. He said the defunct East African Airways used to make its profit in Tanzania where there were more passengers and airports than in Kenya and Uganda. He said he was shocked to learn from the Minister’s estimates that ATC books had not been audited, “How can one run such a big airline without auditing its books ?” he asked. On airports, Ndugu Lowasa said that he could also not understand why the Ministry took 3 months to float a tender for the reconstruction of the Mwanza Airport. He said Mwanza airport was one of the most important airports in the country and should not have been left to disintegrate. The Zanzibar Ministry of Communications and Works each year checks on the seaworthiness of private dhows prior to issuing them with new licences to carry passengers and cargo but does not demand from the operators the fixing of radio equipment on the dhows as the sets are not available in Tanzania. The Deputy Minister of Communications and Works, Ndugu Mohamed Abdallah Khamis said the Ministry’s engineers also check on the condition of life jackets and life buoys. 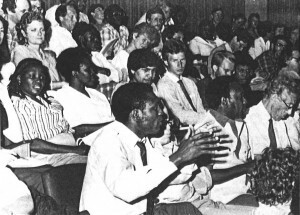 A Conference Held at the School of Oriental and African Studies (SOAS) 26th and 27th June 1986. This was an impressive occasion. The photograph above by Paul Fo (SOAS) shows part of the packed audience. Michael Hodd to whom much credit is due for organising this ambitious affair (and who also received brickbats when things did not proceed as he had intended!) was himself surprised by the size and scale of the participation Furthermore, the conference could hardly have been better timed as Tanzania adjusts itself to the dramatic changes now underway. There were participants from almost all the major centres of learning in Britain which are interested in Tanzania; there were also representatives of FAO, the World Bank, ODA, the British Council, the Britain-Tanzania Society, the Scandinavian Institute of Africa Studies, the College for Developing Countries, Antwerp, the Centre for Development Research, Copenhagen, the Institut fur Afrikanistik de Univer:sitat, Vienna, the Institute of Social Studies, the Hague and a contingent from the United States who took a prominent role. Above all there were the large group of participants from Tanzania, one for each major subject area in the programme and many more besides, whose contributions were not only, in general, the most clearly delivered but also, naturally, the most up to date and often the best informed. They were characterised, as Gus Liebenau (Indiana) put it by a combination of pragmatism and intellectual vigour. The frankness of their contributions also compared well with the directness of the criticisms coming from many of the non-Tanzanians. As Tamin Amijee (Queen Mary College) put it “Nyerere is to Blame” might have been a better title for the conference. A much appreciated remark by Philip Raikes (Copenhagen) about the beneficial effects of changing one’s mind from time to time was also appropriate to the occasion. The final section of the conference on political issues was extremely interesting. Jeanette Hartman (University of Dar es Salaam) in a thoughtful paper spoke of a “government without governance and a state without a system.” Part of a paper on Zanzibar by David Throup (Cambridge) was challenged by another speaker and Haroub Othman queried the appropriateness of the conferences s theme because as he said, “Nyerere will continue to be a great influence on the country for a long time to come,” Many were disappointed that Mr Othman’s verbal contribution to the debate had to be cut short due to time constraints. A clear division seemed to arise between two groups of participants – those accustomed to regular sparring matches at other conferences and those enjoying the novelty of the occasion. But John Arnold (Southampton) told me that he found at this conference a new willingness to debate with rather than abuse or ignore those with differing views. I believe, however that I was not the only one present to be astonished by the aggressiveness of some of the remarks made by certain of the academics about their fellows. There was too strong a tendency to want to discuss socio-economic hypotheses about what happened in the past but As Henry Bernstein (Wye) pointed out however “the great villagisation debate….ground to a halt in the late 70s” yet this and other debates continued to rumble along at this conference. Members of both groups of participants expressed some frustration with the conference. To the first group it was “superficial” ; to the others it was “too academic”. In my view it was good’ for the two sides to meet. It might have been better if they had been able to do so in a more structured way, through, as Mick Silver (Bath) suggested, small working groups running in tandem. It was Mohamed Halfani (Dar es Salaam) who finally admitted something that many speakers were reluctant to say. “What is to be done? Like everybody else in the conference I am shunning this problem and saying it would be presumptuous of me to suggest alternatives”! Haroub Othman, University of Dar es Salaam. “The painful thing for Nyerere (as compared with similar leaders) would be for him to sit in Butiama and see all his progressive achievements eroded away. Nkrumah was far away from home in Guinea when the changes were made, Nasser was in his grave before Sadat made the changes. papers in future issues. We do have room for part of one paper however. It was quite different from all the others. Through its originality and perception of what the Tanzanian man (in this case, woman) in the street thinks about the Nyerere years (as evidenced by Mwalimu’s speeches) we may gain a clue as to what Tanzania after Nyerere could be like, The paper is entitled “The Nyerere Heritage” and consists of an imaginary dialogue between a thirty year old female primary school teacher and a 35 year old male linguistic student. Question from the linguistic student: When Nyerere finally leaves, do you think something of his style of public speaking will remain with us? Q: Apart from lexical influences, is there anything else about the way Nyerere spoke which Tanzanian politicians will have to inherit or may inherit? A: I suppose his way of saying “Ndiyo” with a high-rising intonation to mean “Yes, you must believe me!” and with a low-level intonation to mean “Yes, and who dares not believe me” will continue to be imitated by some politicians. Q: What message would you give to researchers like myself who are interested in linguistic differences between lectures, sermons, harangues and such like? A: I would like people like you to come up with theories which discourage upstart politicians who would wish to reduce Nyerere’s oratorical style to mere techniques used to elicit laughter or agreement. Just because a lot of us always laughed whenever Nyerere started to laugh in his peculiar ironic way, and we used to clap in agreement whenever he said his many “ndiyos”. Some of these careeri5t politicians think people like me would do the same if they mimicked Nyerere! Q: What sort of theories would satisfy you? A: Well, theories which looked into things like what kinds of speeches Nyerere gave to party conferences and what kinds did he give to Parliament, What sort of speeches Nyerere gave to open air mass rallies at Mnazi Moja and Jangwani in Dar es Salaam and what sort he gave to a selection of Dar es Salaam Party and Government leaders at Rarimjee Ball or Anatoglu Hall. There were times when he seemed to lecture in a most soliloquising way and there were times when he seemed to use his Dar e s Salaam audience to indirectly give a sermon on humanism to world leaders outside Tanzania. Very rarely did be engage in demagogic political stunts to win some political favour from his audience like most politicians in the so-called older political democracies. Q: What impression do you form of Nyerere as a politician from his political speeches? A: I think he carried conviction and honesty in his discourses on the evil of one people ruling over another, and how this corrupted both the coloniser and the colonised. He stirred in one a sense of pride in one’s own African ancestry. His speeches during the war with Idi Amin in 1978/79 were most powerful in arousing in most Tanzanians a sense of outrage against a11 forms of oppression irrespective of the person committing “dhuluma”. The anti-Amin war songs and speeches evoked the “spirits” of Mkwawa and Songea and the anti-colonialism Maji-Maji Resistance War of earlier times. This part of the Nyerere heritage will stay in the hearts of Tanzanians like myself for a long, long time. Who knows, this part of the heritage will come in handy should South Africa do to Tanzania what the United States did to Libya! Q: Wouldn’t you say that in practice he would only be remembered for instituting the one-party state and watering down the role of parliamentary democracy? A: Well, I don’t know what you people in universities will remember him for – but I know this: even many years after he has gone his anti-umwinyi, anti-dhuluma sentiments as they reflected themselves in the 1971 Party Guidelines (Mwongozo) – proclaimed after the Idi Amin Coup in Uganda and the attempted coup in Sekou Toure’s Guinea the year before – as well as in the speeches delivered during the anti-Amin war will have a long term impact on Tanzanian society. Q: But what came out of his speeches as his attitude towards institutions like parliament and elections and a free press ? A : I don’t know what you people would say was his attitude to democracy. All I know is that he seemed to be saying that countries like Great Britain did not necessarily Rave democratic institutions mere1y because there were opposition parties and that newspapers were owned by rich capitalists who competed amongst themselves for readership and control over the news. I do not believe that at village level there will be any advantage in having one party which believes the village should grow coffee and another which commits itself to uprooting the coffee as soon as they win control of the village council! I don’t know what democracy means in any other terms than those set in Nyerere’s speeches. I don’t know whether the colonial governors left any manuals on how best to run governments democratically ! My main complaint with CCM (and TANU before it) is that they tend to allow too many capitalist crooks who engage in Ulanguzi to infiltrate them. Q: What about his attitude to African liberation ? A: At first I did not understand when he said recently that it was sad he had participated in the foundation of a Tanzanian nationalism instead of an East African nationalism or an African nationalism. Listening again to his speeches during the anti-Amin war and his comments on the famine in Ethiopia I can see he is a man who is more proud of having the ARC school at Morogoro than he has so far admitted. His naming of a stadium in Sumbawanga as Nelson Mandela last year is very symbolic. This was the last thing he named before retiring from the presidency! Q: What would you remember Nyerere for in the field of agriculture and industry? A: In the late 1960’s things were good. My brother secured a job with the Cotton industry in Mwanza although we come from Mbinga which grows coffee. He used to come home during his holidays with lots of stories about life in other parts of Tanzania. He would tell us about the steamships on Lake Victoria and locomotive train rides between a very big city with lots of cars and a town known as Dodoma which was going to replace Dar es Salaam as the big city! My mother was unhappy at first because she did not like losing someone who might have helped on our coffee farm. But then, my brother used to send money and clothes to my mother, and most of us young people did not share my mother’s enthusiasm for farm work in the same village one was born in and was to die in. Q: Do you think he favoured small peasants like your mother enough? A: I don’t know. I think my mother has always been happy with Nyerere. She only complains when the price of coffee goes down or the prices of corrugated iron sheets or clothes go up. But I suppose Nyerere had children like myself who learned about life in other parts of the world and wanted the good things of the city. People in factories and offices have holidays – paid leave they call it. They have pensions. They have greater independence from control by their parents and relatives. I hear that in Europe people are paid for quite long periods of time for doing nothing! Who would not like a life like that ? I suppose Nyerere favours peasants like my mother but he too has children like myself who want Tanzania to develop and be like those European countries. The Europeans who come over here are always found enjoying themselves in our hotels in our own country! Who would not like life like they lead? I am sure Nyerere’s love is torn between that for his old mother and that far his young children. Q: What will remain in the minds of most Tanzanians as the thing they inherited from the Nyerere e rain the sphere of education? A: The institution of National Service (Civil and military) for all higher secondary and tertiary level graduates, the use of Kiswahili as the medium of education in primary schools, the 1974 Musoma Resolution on Adult Education and universal primary education have had an impact on Tanzanian social life which has yet to be assessed. The philosophy of Education for Self- Reliance (although it has not been very successful in many practical terms) has had a very great impact on the practice of education in Tanzania. A young chipukizi (pioneer) in Tanzania is likely to know more about what is going on in South Africa, Nicaragua, and Palestine than most children of her age in Britain for instance. All these things are not visible but they will be, should Uncle Sam do a Grenada on Tanzania! These Nyerere inheritance s will certainly make Tanzania very difficult to rule in a completely right-wing way. Q: Did Nyerere strike you as someone who wished to urbanise Tanzania? A: I have been to Dodoma. If he had had his way he would have wished Dodoma to grow up into a village-like capital city – a compromise between his love for the social harmony of his mother’s peasant life and his sympathy for his children’s aspiration for economic growth and material development in the European sense. Q: If your children asked you what Nyerere’s attitude to employment was, what would you say? A: I will tell them to listen to his speeches! I think his idea of employment was again influenced by his retaining close contact with peasants like his mother in his home village. To me, employment means being employed by the state. To Nyerere you got the impression that it could mean both employing oneself on a peasant farm and being employed on a village communal farm on a wage and “paid leave” basis! I think t his problem is too complex for me t o explain, but maybe ecologists, and humanists, and people like that, can explain it better. Was it to be “kufanya kazi” or “kuajiriwa” ? The dialogue between the imaginary school teacher and the imaginary linguistics student is as realistic a depiction of the perceptions of quite a number of Tanzanian lay people of what Tanzania after Nyerere will be, as could be presented to a conference of economists, political scientists and sociologists. The apparent naivety of some of the contributions should not belie the seriousness given to the issues examined. The German journal “Afrika” in its February/March l986 issue tells the story, from a woman’s point of view, of the development of wine growing in Tanzania. It relates how wine cultivation began in 1957 when Italian missionaries from the Bihawana mission near Dodoma planted grape, vines. Initially, the pastoral people of Dodoma showed little interest but, according to the article, “After the Dodoma campaign in 1971, during which 30% of the population was resettled in villages a new start was made with the establishment of wine growing. At the grape harvest of March/April 1980, a total of 94 acres were under cultivation in the villages of the Dodoma rural districts. In some villages, there are vineyard cc-operatives but as a rule wine growing is carried out individually by the local farmers in a position to invest money for that purpose. This means that they sell cattle, or other market produce, to get the necessary funds. The local women cannot invest any money, because what they earn from the sale of market produce goes as the housekeeping money for the family. The strenuous digging of the ditches for the vines is done by the men and women together. The man clears a piece of his land, women burn the brush wood. Through a consultancy service, the farmer learns how to prune the vines, and to carry out effective plant protection and pest control. His wife and his childrens care off the birds before the grape harvest. In an article headed “Lowering Expectations”, “Spur” of April 1986 reviews the history of the British rural aid programme in Mtwara Lindi. It reads, in part as follows, “The local population must be bemused by the activities of the British over the past decade. First the flourish of the initial rand project – indeed it is interesting that it was the Tanzanians who -persuaded the British to restrict themselves to two rather than three regions, lest they bite off more than they could chew. Then the extensive questioning, and the raising of expectations of what help might be provided; uncertainty as London dithered about the future of the project; and the eventual recalling of vehicles, renaming of the project, and the final retraction from some of the earlier implied commitment. This has all happened over less than a decade, during a time of worsening economic conditions in Tanzania; as usual, Mtwara and Lindi regions, at the end of the line both literally and metaphorically, have experienced more than their fair share of these difficulties. The article goes on to say that these new small projects, many staffed by volunteers, include goat and rabbit breeding programmes and a freshwater fish project. Commenting on the budget in its August 1986 issue, “African Business Management” writes, “Since the early1980’s which culminated in the prevailing dreadful economic situation, Tanzanians inside and outside the Karimjee parliamentary building have been waiting to hear only one thing in the annual budgets unveiled by the Minister for Finance, Planning and Economic Affairs, Cleopa David Msuya – the devaluation of the shilling. This time, however, things were different, Msuya came up with what is now billed as a generally fair budget which has considered the plight of tax-burdened workers, the incentiveless peasants and already privileged executives. Fishermen using dynamite are destroying much of the coral reef off the coast of Tanzania with the result that erosion is threatening beach hotels and private properties according to an article by Frank Nowikowski in the May issue of “Commonwealth”. The article goes on: “A number of homes and some hotel buildings have fallen into the sea . Destroying the coral has accelerated the coastal erosion near the beach hotels. Many have invested in groynes to break the power of the waves and prevent further property being claimed by the sea. Although effective, these measures disfigure beautiful beaches, an example being in front of the Airicana Hotel where sand filled giant black sausages dominate the beach. The Paris based “Marches Tropicaux” in its issue dated Bay 9th l980 compares the way the spread of AIDS Is being dealt with in Tanzania and such countries as Kenya, Rwanda and Ethiopia. In the latter countries there is reported to be something of a blanket of silence. Tanzania on the other hand has taken the initiative and lifted the curtain. Tanzania’s Minister for Health announced in April 1986 that AIDS (for which there is now a Swahili word – “Ukimwi”, an abbreviation of Ukosefu wa Kinga ya Mwili – Editor) is present in some 17 of the 25 regions of the country, particularly in the Kagera region near the frontiers of Rwanda and Uganda. Some 125 cases had been reported by September last year in Tanzania of whom 60 had died. Research workers estimate that 1 in 10,000 of the inhabitants of the Kagera region are now potential carriers. “The Parliamentarian” in its April 1986 issue stated that the Minister for Finance, Planning and Economic Affairs had tabled a Bill in the National Assembly earlier in the year seeking to provide retirement benefits for specified leaders. The Bill provided that the retiring President would be paid, among other things, annually TShs. 124,000 taxfree and would also receive TShs.3,105,000 tax free as his pension. The retiring Vice-President would be payed annually TShs. 84,666.60 tax free, a pension of TShs.2,105,000 tax free and a total sum of TShs.250,000 as a resettlement allowance. Participating in the debate Ndugu Lumuli Kasyupa (Kyela) criticised the Bill because it did not include other leaders such as Ministers and Members of Parliament. He therefore urged members not to approve the measures proposed until the Government had made the necessary amendments that would cater for all leaders. The Member for Arumeru, Ndugu Paniel Ole Saitabau, cautioned against a trend that was emerging in the House that was likely to lead to MP’s being misunderstood by those who elected them. “If we start discussing our interests now in this new House we will be very unpopular with the people.” he said. Speaking on the same Bill, Ndugu Ernest Nyanda (Magu) urged MP’s to concentrate on the Bil1 instead of calling for Bills catering for MP’s and Ministers. The Bill was passed in its original form. The Nigerian “African Concorde” in its August 1986 issue reports that Tanzania will maintain its oil exploration efforts despite the unsatisfactory progress made since the exercise started in 1050. Replying to a question in Parliament, the Deputy Minister for Energy and Minerals, Ndugu Maokola-Majogo was reported to have said that despite the problems which have hampered oil exploration in the past, some companies were still negotiating with the Government for oil exploration permits. Ndugu Majogo informed the House that oil exploration had been going on in various parts of the country since 1950. However, none of the wells sunk so far had shown any sign of oil. natural gas though was discovered at Songo Songo in 1975. The natural gas is now awaiting exploitation. “Jeune Afrique” had a short article in a recent issue which spoke of “inquietude en Tanzanie.” Poaching in national parks, particularly the Serengeti was said to be reaching alarming proportions. In the first 3 months of this year 35 elephants had been killed despite efforts of game wardens unable to fight against poachers shooting from jeeps and helicopters. The average price of ivory was said to be 68 dollars per kilo (earlier this year) and an elephant tusk was said to weigh between 45 and 65 kilos. “Calculez…” the magazine advised. This development programme in the Hanang Wheat complex in the Arusha region which was featured in ‘Bulletin’ number 24 continues to attract controversy. It figured prominently and was much criticized in one of Ali Mazrui’s T.V. programmes on Africa. A recent court case between the National Agricultural and Food Corporation (NAFCO) and the Mulbadaw village council is also the subject of some lengthy correspondence in the May/June issue of “Africa Events. ” The case was concerned with some 22,793 acres of disputed land on which NAFCO had paid TShs.38,802 for unexhausted improvements. In a special “Water Survey” in its August issue “African Business” states that sewerage is a subject that most people would rather not talk about let alone allocate funds to. Improved pit latrines are described as the only possible way of extending the numbers covered by adequate sanitation and points out that all Tanzanian householders have been obliged by law since 1974 to install pit latrines. The big problem has been to persuade villagers to make minor improvements to existing designs which can help reduce the diseases associated with latrines. The “Improved Pit Latrine” being promoted by the UN was said to have evolved out of practice in Tanzania and Zimbabwe. One of the improvements in the design is the inclusion of a chimney or ventilation shaft (covered by gauze or wire netting) which keeps the pit relatively odourless; flies and mosquitoes are attracted up the shaft by the light but are not able to escape. The “Sunday Telegraph” has published four news stories in recent months on the subject of four donkeys. A team of British explorers led by Mr. George Tardios a reengaged in a two year attempt to I retrace the steps of the Victorian explorer Stanley. The donkeys were bought by the explorers from traders who had ill-treated them. The donkeys had subsequently performed well on the 1500 mile trek on the route followed by Stanley and the explorers did not want to abandon them at the end of the expedition. They cannot be imported into Britain because of strict rules designed to keep out African horse- sickness. Mr. Tardios therefore appealed for help to Prince Philip, Mrs Thatcher and Mr Joplin, the Minister of Agriculture. Funds were not apparently forthcoming for transporting the donkeys to Cairo, but in its June 22nd issue, the “Sunday Telegraph” reported that the Tanzanian Air Force had come to the rescue by agreeing to fly the donkeys from the shores of Lake Tanganyika to Kenya where they will be given a retirement home near Nairobi. Generous donations had been received towards the cost. Years ago when I was an English teacher in Madagascar, I asked a class to write about their home town. Most of the class began with a sentence like “Tulear is 600 kilometers from Tananarive, the capital and 6000 kilometers from Paris”. For them, Paris was the focal point of the world; Africa might as well not have existed. Similar attitudes prevail throughout Africa wherever different languages and customs adopted during the colonial era have led to a lack of awareness about neighbouring countries. One of the many products of the agonisingly slow and belated progress towards increased co-operation in Europe has been a desire to lessen these barriers between Africans created by colonial rule, and to encourage development and regional co-operation. Bilateral assistance, conditioned as it often is by language and traditional trade ties, usually tends to reinforce these divisions. By bringing together several former colonial powers and other important bilateral donors, the European Community is uniquely well placed to encourage pan-African initiatives such as the preferential trade area, as well as supporting joint action amongst countries affected by problems such as the spread of pests and diseases, or desertification. Readers of the Bulletin will be aware of the importance of such concepts as Pan-African co-operation in Tanzanian policy over the years since independence. From the beginnings of the Organisation of African Unity through to present day initiatives like the PTA and the Southern African Development Co-ordination Conference (SADCC) Tanzania has been prepared to lend its weight, even though its own experience of closer co-operation in the East African Community highlighted the difficulties which can arise. If such problems can arise between countries with strong historical ties how much more hazardous must wider co-operation be ! Yet it is not only natural – the early explorers would surely be dismayed at the cultural gulf and plain lack of contact between some of the areas in the region – but even a geographical necessity that a common approach to problems should be sought. Tanzania’s importance stems not just from its political will in approaching these issues but from its strategic position as a transit country for much of central Africa and from the importance of its own natural resources in the potential development of the region* The EEC through the European Development Fund is supporting Tanzania’s efforts to improve transport facilities which are important for the development of neighbours such as Rwanda and Burundi, by improving the port facilities at Kigoma, assisting Tanzanian Railway Corporation and helping to construct new facilities at Isaka and a road linking them with Rwanda. Emphasis has also been placed on the working out at national level of policies for food production; such a strategy has now been produced for Tanzania. The idea is to bring together all the various factors affecting the provision of an adequate diet for all the population. Regional food security is best achieved by starting at village level or even the individual shamba. Tanzania has the potential not just to feed itself, but to produce exportable surpluses. However, before that potential can be realised, many constraints must be overcome. Tanzania is almost the poorest of African countries, with all the problems that they share: acute shortage of foreign exchange, weak planning capacity, poor institutional performance. Moreover Tanzania faces particular difficulties in ensuring that all its people have sufficient food, not only because of its size and the poor state of its infrastructure, but also the remoteness of the food producing areas from the deficit regions. Any responsible programme of assistance towards the provision of food for all in Tanzania must face these problems within a realistic time scale. The Tanzanian Government acknowledges that the sector has suffered from inadequate investment, inadequate incentives to producers, poor performance of the relevant institutions, a lack of foreign exchange and a transport service in a state of disrepair. In its 1982 policy statement on agriculture, on the basis of which the national food strategy was prepared, the Government outlined measures covering institutional reform, prices and input supply and marketing in order to move towards the objective of self sufficiency in food. It was within the framework of this approach that talks were held in Dar es Salaam in July 1985 between the Tanzanian Government and the European Commission delegation headed by Dieter Frisch, the Director- General for Development. The aim was to agree on the way in which funds available to Tanzania for its national development programme, from the EEC would be allocated. Put simply, the question was, what was the best way for Tanzania to spend about Shs.2,130 million in foreign exchange? Most farmers in Tanzania grow crops for cash as well as for their own food. In some areas the two crops are grown on the same piece of ground, as is often the case with coffee and bananas grown in the North and North-West. How much each family decides to grow of each depends partly on the price which they will receive for each crop as well as on the suitability of the soil and their own requirements. But Tanzania needs to earn foreign exchange from export crops like coffee and cotton to buy both the inputs needed to grow more food, and the spare parts and fuel to move food around the country. A balanced programme requiring food and cash crops was therefore required. As the EEC has been the main donor for the development of coffee production in Tanzania over the past few years, through a fairly successful programme of support to the Coffee Authority of Tanzania (now the Coffee Marketing Board) which has ensured that coffee production levels were maintained, it was decided to focus the allocation of the finance available on agriculture in the coffee-growing areas. The programme to be supported will cover all the problems affecting coffee and food production in the se areas, including the need to ensure that the newly formed co-operatives can do their job properly. Transport is a particular problem in some of these areas, and the BBC agreed to consider proposals for the repair of lorries along the lines of a successful project carried out a few years ago, and for the maintenance of minor roads giving access to agricultural areas. The funds available to this programme result from the signature in 1984 of the third Lome convention, a contractual agreement between the EEC and over sixty countries in Africa, the Caribbean and the Pacific (known as the ‘ACP’ countries). This is a unique agreement covering not only finance for national and regional development, but also a scheme for the stabilisation of export earnings (‘STABEX’ for short) and a wide variety of other forms of support. The EEC’s food aid and its scheme for co-financing projects with voluntary agencies like Christian Aid and Oxfam are funded separately from the Convention (they come from the EEC annual budget) but every attempt is now being made to ensure that all these different forms of co-operation fit together within a coherent framework. The EEC is fast becoming one of Tanzania’s major aid donors, and in fact the share of Tanzania’s aid coming from the Community (including Member States ‘bilateral programmes) is now over 40%. Coupled with the fact that about 50% of the country’s trade is with the European Community, this means that the ties between the two are stronger than at any time since independence.